Lake Champlain Chamber Music Festival’s “Winter Encore Concerts: Living Traditions” at the E. Glenn Giltz Auditorium at SUNY Plattsburgh on Friday, February 25, at 7:30 p.m.; and at the Elley-Long Music Center at Fort Ethan Allen in Colchester on Saturday, February 26, at 7:30 p.m. lccmf.org. Summer may seem a long way off for classical music fans who, while mourning the Vermont Mozart Festival’s passing, await a string of more intimately scaled chamber-music events. Among them: the world-famous Marlboro Music Festival; the Central Vermont Chamber Music Festival in Randolph; and public concerts by the faculty of the Green Mountain Chamber Music Festival, a monthlong music school housed at the University of Vermont. Meanwhile, the relatively new Lake Champlain Chamber Music Festival, which joined the state’s summer musicscape in 2009, includes an off-season bonus: an annual “Winter Encore” concert featuring the summer festival’s greatest hits. Though it involves aspiring musicians through master classes and a nationally competitive Young Composers seminar, the LCCMF is mainly a flurry of high-level professional performances packed into one week in June at the Elley-Long Music Center in Colchester’s Fort Ethan Allen. So the winter concert is not to be missed. This year’s remix, happening this weekend, has been dubbed “Living Traditions” in honor of three works on the program composed within the last five years by composers of different generations: R. Murray Schafer’s Trio for Violin, Viola, and Cello David Ludwig’s Aigaios for String Quartet, and Tim Woos’ simply titled String Quartet. Each man influenced the next. Seventy-seven-year-old renowned Canadian composer Schafer’s highly accessible music “opened up a world of possibilities” for Ludwig, says the 38-year-old, when he first heard it as a student at the Curtis Institute of Music in Philadelphia, where he now teaches. Ludwig is the LCCMF’s composer-in-residence, as well as the Vermont Symphony Orchestra’s new-music advisor. Ludwig’s piece, named for the god of sea storms, was originally commissioned by the Newburyport Chamber Music Festival in Massachusetts, the site of the events depicted in Sebastian Junger’s The Perfect Storm. Aigaios promises to be dramatic: “I wanted to capture the real chaos of a bona-fide hurricane,” Ludwig says. Woos, an 18-year-old from New Haven, Vt., was in turn influenced by Ludwig’s ability to write music with a “clear purpose.” “He knows exactly what he wants you to take away from a piece. And the sounds he gets — he’s just such a creative person,” enthuses the voluble first-year Curtis student. Woos first connected with Ludwig in eighth grade, when the seasoned composer posted responses to Woos’ first writing attempts on the Vermont MIDI Project, an innovative online music-composition forum. (The project is just one aspect of Vermont’s rich composing scene, which was recently honored when Gov. Shumlin declared 2011 “The Year of the Vermont Composer.”) Woos completed String Quartet as a 2009 LCCMF Young Composer under Ludwig and continues to study with him at Curtis as one of the highly selective institute’s two composition students. 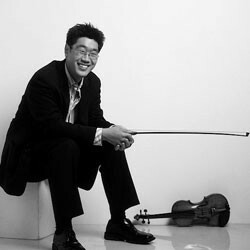 LCCMF’s founder and artistic director Soovin Kim, a 34-year-old violinist, says the Winter Encore is a chance for people who missed the festival to catch its highlights, and for returnees to hear the same pieces played with a “slightly different interpretation” by other musicians. Kim is from Plattsburgh, N.Y. — he’s bringing the Winter Encore there, too — but played for five years with the Vermont Youth Orchestra, so he considers Burlington his “musical home.” Kim went on to study at Curtis, also — under Jaime Laredo, who trained and then taught violin there for 35 years before becoming conductor and music director of the VSO. (Ludwig identifies Laredo as the root of Burlington’s rich connections to the country’s most competitive music conservancy.) Kim currently teaches full-time in the U.S. and part-time in Korea, and belongs to chamber groups in both countries. “I’m so pumped,” Woos declares. “It’s why we’re composers: to work with musicians like this, and hear what they bring to the music we write. It doesn’t get better than this.” The audience is likely to agree.